Juno, a long-sought protein named after the Roman goddess of fertility and marriage, has been discovered on the surface of the mammalian egg. This protein recognizes its sperm-riding counterpart, Izumo, at the very first interaction between egg and sperm. Although Juno and Izumo bind to each other weakly, the union is fateful, as it results in fertilization. Izumo, which is named after a Japanese marriage shrine, was discovered by Japanese researchers in 2005. But its binding partner on the egg remained a mystery until researchers at the Wellcome Trust Sanger Institute identified the egg’s Izumo receptor, folate receptor 4 (Folr4). This discovery prompted the researchers to suggest changing Folr4 protein’s name to the more felicitous Juno. 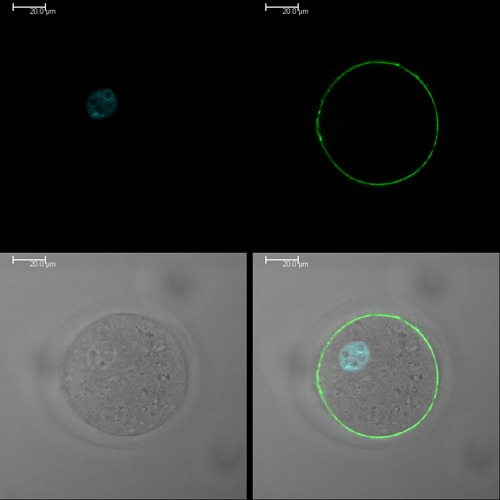 The scientists created an artificial version of the Izumo protein and used this to identify binding partners on the surface of the egg. Using this approach, they discovered that Izumo on the sperm interacted with Juno on the surface of the egg to initiate fertilization. The team developed mice that lacked the Juno protein on the surface of their eggs. These mice were infertile and their eggs did not fuse with normal sperm, highlighting that the Juno protein is essential for fertility in female mice. In the same way, male mice lacking the Izumo protein are also infertile, highlighting its essential role in male fertility. The team is now screening infertile women to understand whether defects in the Juno receptor are a cause of infertility. If it is, then a simple genetic screening test could help inform the appropriate treatment for women struggling to conceive naturally by reducing the expense and stress often involved in assisted fertility treatments.